The room server due to the required conditions must be adequately monitored and controlled. High temperatures in the room mentioned require adequate control and management - using products from the GSMTRONIK in a simple and inexpensive way to protect data centers from the effect of unforeseen events. Maintaining a strictly defined temperature and humidity in the server rooms is a priority of ensuring smooth operation of the entire system. 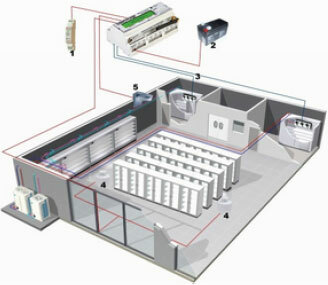 We also offer drivers alternating operation SPN and SPN - IR - systems enabling control of 4 air conditioners. An additional advantage is monitoring temperature and an alarm in case of exceeding the set threshold.